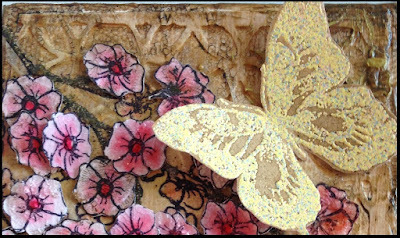 to blog with us and we couldn't be happier with her use of the 'Fallen Blossom' by Nicole Wright. With Spring upon us, Mother's Day fast approaching, and life in general whirling by, Sara reminds us to stop and smell the flowers! Or a least colour some , while we wait for flowers to bloom in Canada's Province of Alberta. Check out Sara's Post and her many awesome creations over the past while. We have truly been honoured by Sara and her willingness to share her talents with us. Thank you so much Sara, for Guest posting our products and for the delightful friendship that has developed. I know we will be seeing you around blog-land lots.and I hope one day, in person too. and it is great to have you blogging with us again! You have showcased Nicole's beautiful stamps so beautifully! Awe thanks for popping here too Claudia. Mwa! I <3 you Sara!! You are so talented and I love that you're a part of my Emerald Creek family! Thank you so much for sharing your ideas and beautiful projects with us! OH WOW! This is freakin AWESOME! As always you rocked it! A special thank you and lots of hugs to Kim for allowing me to share some Emerald Creek blog time with her and her amazing Design Team! Nicole's stamps are beautiful and made this little canvas a pleasure to put together! And I didn't mind fussy cutting those blossoms a BIT! Therapeutic stuff! I think you know how much I LOVE Easter Parade powder! Hugs to all you ladies! You know, I just have so much love & respect for you and what you do. I've looked at this post a dozen times and studied it and there's nothing I would change. I would want re-create it exactly as it is. (And that's something I never do). Thank you so much again Sara. Big Hugz!!! Wow! Beautiful canvas Sara Emily! Thanks for being apart of the Emerald Creek Team for the last couple of months!! This is absolutely gorgeous!! Love the dimension on the flowers along with the pretty butterfly!